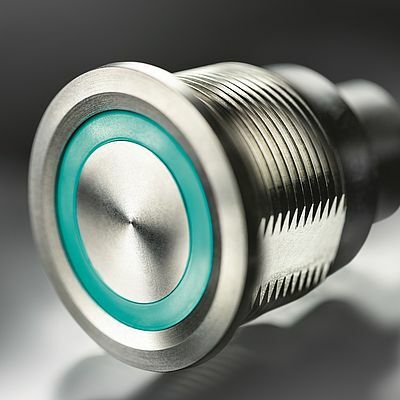 SCHURTER launches momentary and latching push button switches with capacitive touch sensor technology inside. Besides a predefined standard offering, there are many visual and functional options available to choose from. These features allow the customer to adapt the push button, or the switch in general, to their individual electrical and mechanical requirements. The new CPS family of switches is available with 16 mm, 19 mm and 22 mm diameter housings. The series is made of high-grade stainless steel. The CPS uses capacitive sensor technology, whereby a touch of the finger on the sensor area causes a change in the electrical field which in turn causes the switch to change its state; this occurs without any pressure on the actuator. The capacitive touch technology eliminates the need for any moving parts, hence making the CPS a long-life product capable of an unlimited number of actuations. The design of the CPS has a high-end look and elegant appearance as it is well-known to SCHURTER's Metal Line. The CPS actuator expands further on actuation options with a so-called finger guide, which is designed to enhance the user experience. Besides a set of predefined standard variations, the CPS can easily be customized to specific customer requirements by simply choosing from a list of options in the configurator list provided in the data sheet. With standard and customized options, the CPS is suitable for many different applications in various industry sectors, like industrial automation, food processing, lab equipment, door and access control panels, white goods, various electronic equipment, just to name a few.